"Sometimes funny, sometimes poignant, always steamy, Hot and Steamy is a hit!" This is a tight anthology similar to Steampunk'd. 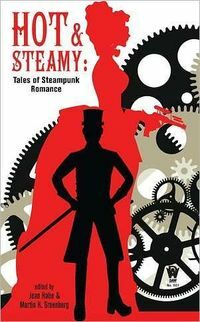 16 tales of romance and steampunk style speculation fill the pages to entice the reader. Although the format is perfect for being able to fit the stories within one's daily life, it is hard to imagine not joyously racing through the entire anthology at one go. The primary reason not to do so would be to make this excellent anthology last longer. Although each tale has its own positive elements, stand outs are Maurice Broaduss's The Problem of Trystan, Jody Lynn Nye's Clockworks, Mickey Zucker Reichert's For the Love of Byron, and Elizabeth A. Vaughan's For Queen and Country, and Marc Tassin's For the Love of Copper. In addition, Donald J. Bingle's Dashed Hopes is a unique work of art.